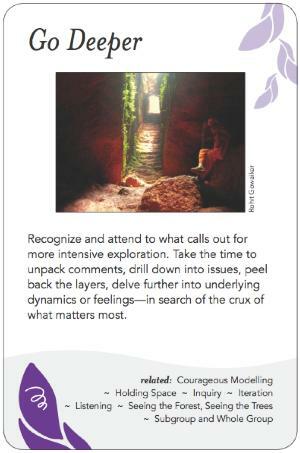 Recognize and attend to what calls out for more intensive exploration. Take the time to unpack comments, drill down into issues, peel back the layers, delve further into underlying dynamics or feelings--in search of the crux of what matters most. Going deeper involves anticipating, listening, recognizing and attending to the essential matter facing a group. Being willing to stop and open up a space to the underlying dynamics and feelings. Taking the time to find and explore deeper in to the crux of the issues that emerges. Probing beneath the surface to discover or clarify an issue. One item/issue of many on the agenda in the moment may cry out for urgent attention; going deeper would suggest clearing other things off the agenda and just attending to this. Where the facilitator and group dance together. They need you because they have not been able to do it themselves, they know what it is, but they need you to help them untangle it. Example in a several day event - we know it is likely there may be storming in the latter half. Build the design to allow and take advantage of this opportunity to drill down and still have time for closure. When planning the agenda for a meeting/event, don't over pack it so there is time for going deeper as the need emerges in the moment. Be attentive to potential barriers to the important work getting done. Example I have the sense that the energy is flat. In some groups that can mean there is an underlying current that has not been expressed. The energy shifts, and off hand comment that points to what people have not been talking out suggests a need to check it out. Hone in - a good questions, change mode - get into small groups to discuss how you feel, what is the crux for you. Or put it to the whole group...slow down... let people catch up, let people breath. If you go for low hanging fruit, you get some results. No need to drill deep if you are getting what you need. Facilitator may sense/think something is important and suggest going deeper, but this area may not be important to the group. It may be an abuse of power to drill down arbitrarily. Who are you to drill if no cues have been presented. If going deeper into emotionally charged terrain, may be a good time to remind group of the agreements/ground rules. And then there is a time stop drilling down and have lunch.